The musical material is highly varied and portrays a wide range of influences, spanning many decades. These include: country and western in the song IDAHO, funk in PODRÓŻ W CZASIE, pop rock in NA MARGINESIE?, a 1960’s soft rock a' la the Beatles in HORYZONT, and a permeating Mexican feel, owing to the expert playing of Latin-American percussion instruments by Tomas Celis Sanchez. In spite of all these musical influences, the album maintains a natural cohesiveness. This was achieved by the use of particular instruments. One of my goals for A2 was to create an acoustically natural and pure album. We employed many vintage instruments, such as a historic Wurlitzer piano, and old-school keyboards by Rhodes and Moog, as well as vintage recording equipment that included several vocal preamps dating from the 1950’s and the 1970’s in order to achieve this feeling. There is one distinguishable feature of this collection which is the old- school, vintage sound style. 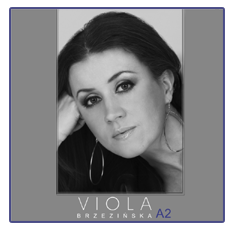 The musical producer of Viola’s new album is a highly acclaimed producer- Marcin Pospieszalski – a three times Fryderyk- Prize winner for the albums of Anna Maria Jopek, Raz Dwa Trzy and Mietek Szczesniak. A2 was recorded in RecPublica Studios in Lubrza and in Tuluba Studio in Poznan. I recorded this album with a team of musicians with whom I have worked with for many years- Jacek Leśniewski( drums), Michał Maliszewski( guitars) and Marcin Riege( piano) and also some of the awesome friends I invited along the way: Lidka Pospieszalska( background vocals), Marcin Pospieszalski( bass guitar, violin, background vocals), Tomas Celis Sanchez( percussions) and Slawek Kosinski( guitars).